I’m Ed Smith, a Modesto Auto Accident Attorney. A frightening situation caused a woman to jump out of a pickup truck in south Modesto on Tuesday, September 20, 2016. A woman had to jump out of a pickup truck in south Modesto to get away from the man driving the vehicle. Authorities are currently searching for the vehicle which is described as a black Chevrolet Silverado that was hauling a trailer at the time of the incident. According to Sergeant Frank Soria from the Stanislaus County Sheriff’s Department, the incident was described as a domestic violence situation. The situation began in Manteca and concluded in south Modesto along Crows Landing Road. It was reported that the woman jumped out of the pickup truck in an area to the north of Hatch Road. The woman sustained injuries to her arms and her legs. However, it is still unknown whether the injuries were sustained as a result of the woman jumping out of the pickup or if the man caused the injuries to her during the incident. Sergeant Soria also stated that it is still unknown whether the woman jumped out of the vehicle while it was moving or while it was stopped. The woman was transported to the hospital via ambulance to be treated for her injuries. I’m Ed Smith. 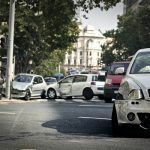 I am a Modesto Auto Accident Attorney and the founder of Northern California’s most extensive and informative personal injury database, www.AutoAccident.com. If you or a loved one has been hurt due to an accident caused by a negligent party, please call me at (209) 227-1931 for free and friendly advice. You can also contact me free of toll at (800) 404-5400 for free and friendly advice. I have assisted residents of Northern California with their personal injury and wrongful death cases for over 34 years. Our clients think highly of our law firm. Read their comments on: Avvo (the attorney rating website), Yelp and Google. I am a California member for the Million Dollar Advocates Forum. You may read through my successful Previous Verdicts and Settlements here.